Pleione Orchids interesting group of orchids from China and the Himalayas. 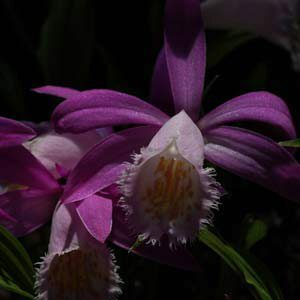 The species Pleione formosana is widely grown and performs well in a temperate climate, but are rarely offered for sale. The bulbs actually live for only one season, however they produce offsets. Flowering in spring these are a lovely flowering plant well suited to growing in pots. Popular cultivars include ‘Versailles Buckleberry’, ‘Tongariro’ and ‘Shantung’, although new releases from specialist growers offer a wide variety. Most Pleione orchids are are spring flowering this includes P. formosana one of the easiest to grow. We grow our plants in a deepish pots, around 150mm tall and also ‘bulk plants’ in a polystyrene box that we sit up on some bricks to ensure good drainage. We also provide plenty of shade, 70% shade cloth in a cool position, and yes we grow them outside, we only use a shade house and the open garden for growing plants. As spring approaches and the days get longer Pleiones will respond to the increased light by putting on new growth, this is when you need make sure that they are protected from snails and slugs. It is also a good idea to keep then under cover to protect the flowers from rain damage. It is advisable to water pleiones at night after the soil temperature in the pot has begun to drop. In terms of fertiliser, Pleiones are hungry plants they, a good soluble fertilizer that if rich in potassium can be applied once a month during active growth, seem to like a little potash, and we use a liquid seaweed fertiliser with good results. A little dynamic lifter will do wonders. Flowers will appear and then the foliage will begin to grow, increase watering at this time. As the plants enter dormancy in autumn decrease watering to a minimum and provide a dry winter. For us Pleione formosa grow best in a finer potting mix than many orchids, although they still require good drainage the finer mix seems to work well. Best time to repot Pleione formosana – winter while they are dormant. Take care not to damage the emerging growth nodes. P.formosanum, P.shantung, P.priceii are three species worth looking for with P.priceii being pictured right. 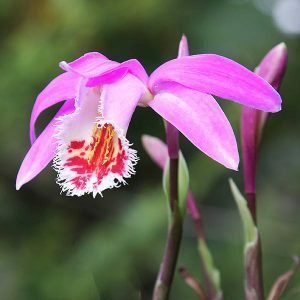 Pleiones require a dry cool winter in order to flower well the next year. The bulbs can be removed from the media after the foliage has died back naturally. Remove all of the old dried leaves. Remove all of the old potting mix . Remember not to break new growth and do not damage the growing eyes. The older dead bulbs should also be removed. You can trim away the old dead roots. Bring the bulbs into a warm dry place for a day or so to let them dry completely. You can then place the bulbs in a freezer bag and keep them in the crisper of the fridge until spring when they are ready to be planted out.